Alhambra, CA - Only six short months ago, with the blessing and support of His Grace Bishop Maxim, our Circle of 100 Chairperson, Ronald Radakovich and his wife Mickey, began an ambitious diocesan fundraising campaign to raise $300,000 for the rebuilding of our Holy Monastery Hilandar on Mount Athos. Their vision motivated and enabled them to inspire 100 individuals/families to become benefactors, donating $1,000 a year for three years. Today, on Saturday, March 31, 2012, we can pause and reflect on what has been accomplished. A Circle of 100 Benefactors have answered a call to embark on a three year journey together to preserve our sacred heritage and significantly contribute, prayerfully and monetarily, to the reconstruction and restoration of our Holy Monastary Hilandar founded in 1198 by the first Archbishop of Serbia, Saint Sava, and his father, Saint Simeon, on Mount Athos. 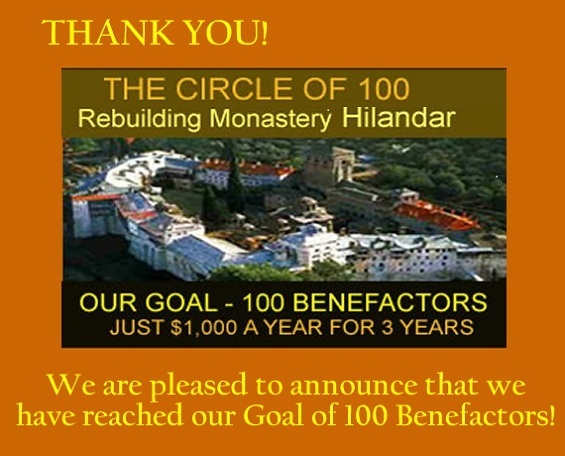 We express our gratitude to all of our Benefactors for the generous support they have shown for the Rebuilding of Monastery Hilandar which has suffered damage time and time again as a result of conquering plundering earthquakes and fires. If you would like to join this special group of people in their efforts to raise funds to help rebuild our Holy Monastery Hilandar, please click here.